Our trusted companion of the last couple years is gone. Fred came to us from Pasado's Safe Haven, rescued from death row at a local shelter. After we heard from vets that he only had months left, he proceeded to live two years of enthusiastic tromps in the snow, trips to the beach and hikes in the woods or just around the neighborhood. 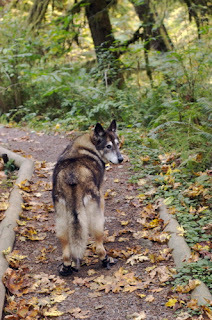 Slowly though, the degenerative myelopathy which afflicted him claimed his ability to control the back half of his body. Despite this, he soldiered on determined to follow his pack leaders and have fun doing it, until recently when he turned melancholy because he simply couldn't manage any more. In his last hours we went, sat and relaxed along a sandy rivershore, watched the waves and the trees move and felt the breeze. He was treated to a special meal out and then we let him go. It is sad to lose him, but hopefully the two years we were able to provide him were as enjoyable for him as they were for us. xo, Tom, Jeanie and Archie. i'm so sorry he's gone, but so happy you made his time fun! Your wrong tho. Fred will never be gone. He'll always be there watching over you between bouts of chaseing bunnies and sniffing all the bushes he can find. Fred will never be far from your hearts all you have to is think of him and he'll be with you. Bye Fred, I'm glad I got a chance to meet you. You sure got lucky to spend time with the Carrel's, they loved you very much. I'll hoist a howl for you next time I'm in the woods, perhaps you'll hear me in doggie heaven. You took some great pictures of Fred! So sad that his time with you 2 was so short. He was one lucky dog to have you for parents.